That degree of pop-culture ubiquity doesn’t happen often to such a young franchise (since April 2012 on Facebook, November 2012 on smartphones). As with Angry Birds before it, if you are on a train this summer, it feels like every other person holding a smartphone or a tablet is playing King’s Candy Crush Saga. If you are on Facebook, you must be getting “requests” from at least a couple of your friends. This ubiquity also means big money as widely reported by the media over recent weeks. King’s figures mention 45 million players playing 600 million times a day. Think Gaming reports $632,867 in revenue per day on the iOS App store alone, and the game is just as high up the charts on Android devices and on Facebook. It’s safe to say that across platforms it’s bringing in millions of pounds every week. But behind the lure of a surprise success story, there’s a master-class in the fundamental digital era paradigm of marketing. King has been around for 10 years. It is an established company with strong backing (€34m from Apax and Index Ventures back in 2005) and a large portfolio of existing games. Its Bubble Witch Saga is one of the most successful Facebook games of all time (and was also among the pioneers of Facebook-mobile syncing about a year ago), but it’s nowhere near as successful as Candy Crush, which truly is its first mega-hit. All true, but I believe this specific product isn’t a random success. You could say the entire category is completely random, lots of similar games rocking gently until they reach a tipping point and then explode. That’s a little like saying casual gaming success works like avalanches, but even with avalanches you can point to some consistent qualities that make them more likely to happen. It’s in their design. And while reverse engineering success is always dangerous, I’ll stick my neck out and point to some interesting elements that frequently aid success and which are especially prominent in the case of Candy Crush. 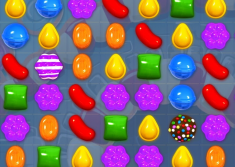 Even when compared to other games by King, it’s very clear that the specific visual style of Candy Crush is the most economically expressed. It has a certain clean gloss; it’s highly polished and focused. Soundscapes and in particular sound effects, enjoy a similar sense of accuracy. King owes the graphic and sound designers of this game a lot. Gameplay itself is instantly recognisable and follows the tradition of pattern-matching games like Bubbles or Bejewelled, with some extra layers of fun added on, all previously tried twists using familiar formulae, but combined meticulously: combos producing special candy, and puzzle-like challenges through level design (rather than procedurally created gameplay) produce variety and depth that keep players interested over time without complicating the basic premise. Notice this is less about explicit story elements, although there’s a loose “Saga” narrative thread tying things together, it’s more of an excuse for showing candy, and even those animations use a more abstract illustration style than in most games (you may even refer to Scott McCloud’s ‘Big Triangle’ model in that sense). If you’ve played even just a few casual games before, you will feel how tight the gaming experience of Candy Crush is. Visual language, sound design and game mechanics combined into an extremely slick package. Candy Crush limits your number of attempts at completing a level, and a few levels in, once you’ve been hooked, you will run out of lives. When that happens, unless you are willing to wait 20 minutes, you are given two options: pay for it, by buying lives, or work for it, by marketing it to your friends. The social marketing aspect happens primarily through asking friends for lives (via Facebook). If enough friends are playing, you can limit the asking to that group already playing the game, but that activity still has a chance of bringing back for new plays (sending free lives is also encouraged). Secondary signals are sent when you pass a level, complete a combo, or overtake a friend in the score rankings of a level, and while many of those never get to show in your feed, some of them come through. Finally, to progress to a new chapter (a collection of levels) you will need three friends to help you “unlock” the next stage. The alternative is to pay. And, eventually, someone, somewhere does – either to simply play again or in order to get through a particularly infuriating level. And while the company says over 90% of users will never pay and even finish the game’s 400+ levels without paying, King still achieve nearly a $3 average revenue per user that adds up to over half a million dollars per day on the iOS*. Freemium model games can often be frustrating if not brutal. Compare Candy Crush with, say, The Simpsons: Tapped-Out, from gaming giant EA. The latter is a game where you rebuild Springfield through Farmville-like mechanics and it celebrates its lucrative license with much love. However, playing it without resorting to buying premium ingredients for extortionate prices is an endless grind that no amount of the game’s knowing winks could cure. By comparison, Candy Crush comes out as extremely generous. It allows a lot of fun, indeed endless fun, without paying money. That fact is probably what makes it easier for users to pay once or twice during their lifetime**. So, just like with the design, Candy Crush’s Freemium elements aren’t ground-breaking, but they seem very well balanced and no doubt come from years of trial and error and accumulated data from the company’s less successful franchises. To summarise, this is a game experience polished to an almost peerless degree, and that experience is matched by equally optimised marketing mechanics. Candy Crush hides a staggering degree of craftsmanship in plain sight. This is a sweet cocktail tweaked to perfection, and like many of summer’s brightly coloured concoctions, it takes a lot of artisanship to make sure it works without becoming sickly. The Skype team had a saying, during its early years: “The brand is the product is the brand”. It’s an interesting characteristic of pure digital products (and similarly with all media-based products) where the products themselves embody and execute the majority of the communications about the product’s proposition. This leads to a situation where the product and brand don’t just “aspire” to get closer, they practically become one. This, in turn, creates a new, seamless, kind of marketing communications, at once clear and effective. Marketing becomes one with the user experience. It’s not that Candy Crush doesn’t need a marketing campaign; a marketing campaign simply couldn’t achieve better results then what’s already at work. With marketing ecosystems becoming increasingly integrated and digital, this dynamic will continue to spill into other categories and the distinction between any product/service and its marketing will continue to blur. And that state of play points to a whole lot of sweet opportunities for marketing. * Naturally I’ve never spent a penny on Candy Crush, but I have a friend who has. ** Personally, I only play Candy Crush for the articles. This entry was posted in Marketing, Viral Marketing by Uri Baruchin. Bookmark the permalink.